To add a shadow effect to all full-size images in the gallery go to the Options step, select the Images tab and click the Add shadow to images and/or thumbs... button. 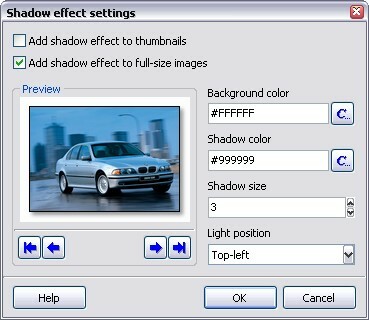 It will open the Shadow effect settings window where you can specify all the parameters of shadow. Now check the Add shadow effect to full-size images box and the preview of the image with applied shadow effect will appear in the Preview section. To achieve the best result you should make the Background color equal to the background color of the gallery pages.